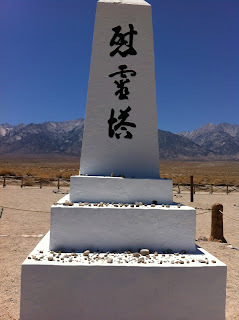 The Soul Consoling Tower was built by internees at Manzanar. 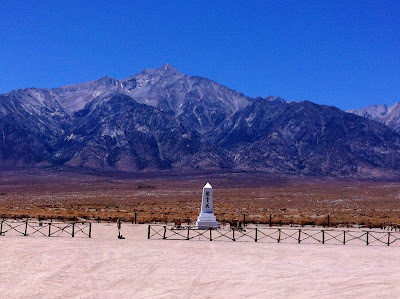 It stands tall and white against the desert sky, face to face with the Sierra Nevada Mountains. Quiet place. Six internees still buried there while others were taken out of the ground and brought home after the concentration camps of America shut down. 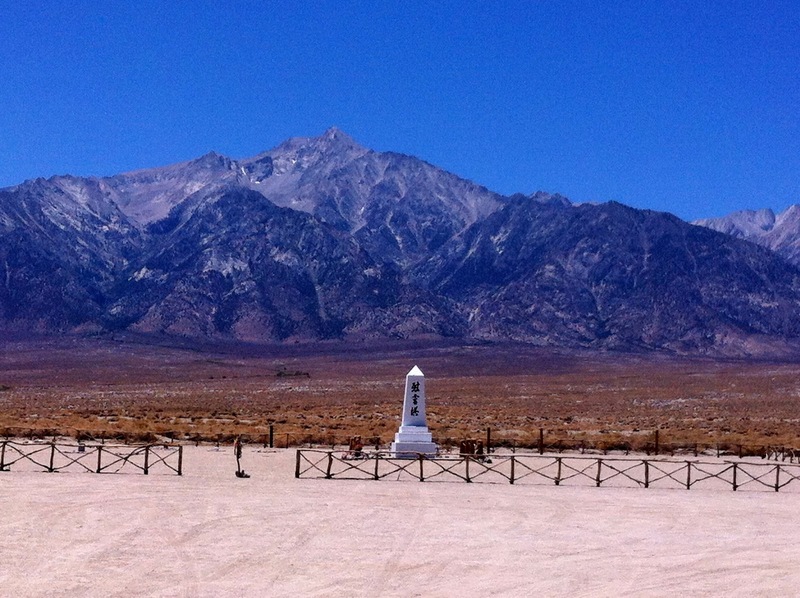 Here, Japanese Americans learned to make the best of a horrific situation. Here, they built rock gardens and flowerbeds, they harvested vegetables from fields they had sown, they sang to one another, hit home runs on makeshift baseball diamonds, dug swimming holes and loved one another. Here, babies were born in barracks made of wood and tarpaper. Here, people ate in mess halls. Stood in lines that stretched around the block in rain, in dust storm, in hot desert sun. Bathed in open showers like cattle, relieved themselves in front of family and friends. Here the unimaginable. Americans incarcerating Americans for the color of their skin, for their ancestry, for the off chance espionage that only fear can conjure up. Who would do such a thing? My sweetheart, a Southern White Man from the mountains of Virginia is a good man who believes in giving everyone the benefit of the doubt. He stands next to me at the Soul Consoling Tower and he comes undone. 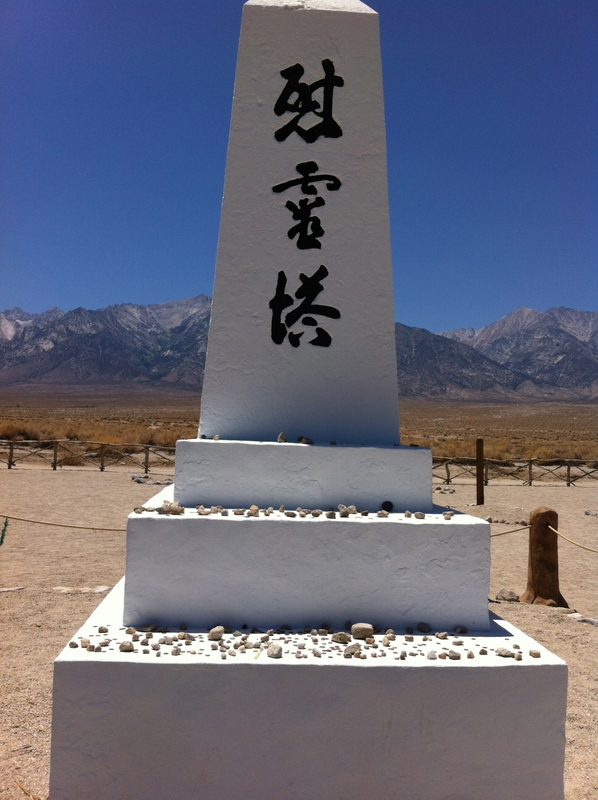 This pilgrimage to Tulelake, then Minidoka, now Manzanar opens his heart wide and he is seeing the unimaginable that is our American history. On the tower, people have placed offerings. Stones from the earth. Coins from their pockets. Peace birds fashioned out of paper. At the pillar, we say our own prayers. We gaze at graves marked by stones. I choose a pebble from the ground and place it on the white altar. He puts a quarter on the ledge. Stands there. And then looking beyond the tower, beyond the barbed-wire-fence he sees the mountain standing blue and hard and tall. This he knows. He goes out into the field. So small against that mountain. So quiet. Later he will tell me about a circle of stones. A flock of paper birds. A secret buried beyond the fence. Who would do such things?